In a R100 million transaction, significant for black economic empowerment and environment responsibility in KwaZulu-Natal, an exciting new venture, SiyaQhubeka Forests (Pty) Ltd, has come into being. This company was born out of SiyaQhubeka Consortium's successful acquisition of 22 000 hectares of Safcol's (South African Forestry Company Limited) commercial forestry assets in KwaZulu-Natal. SiyaQhubeka Forests commenced operation on 1 October 2001 from its original office in Richards Bay and its three plantation offices in Kwambonambi, Dukuduku and Port Durnford (Zululand). SiyaQhubeka Forests has successfully converted the lease area into fast-growing hard wood pulpwood plantation over a five year period and will do so within the requirements of the Forestry Stewardship Council (FSC) certification. It is anticipated that this conversion will bring about upliftment in rural communities through the transfer of both skills and the ownership of forestry assets. 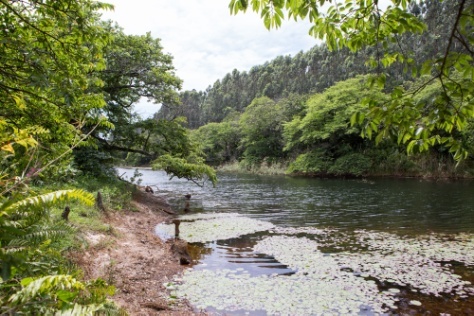 SiyaQhubeka has played a leading role in increasing the size of the Greater St Lucia Wetland Park by facilitating the inclusion of 9 000 hectares, on the Western Shores of the lake, into the park. In addition, the consortium has supported moving the boundary fence of the park to include a sizeable portion of its plantations, allowing for better management and freer movement of animals and increasing the park by some 15 000 hectares. Some 120 elephants have already been released into this section of the park. This is a world–first for commercial plantation forestry and a World Heritage Site. The Siyaqhubeka Logo, What does it represent? SiyaQhubeka's corporate identity represents a symbiotic relationship between the environment, the forestry sector and the people of neighboring communities. With symbiotic forestry as its fundamental philosophy, SiyaQhubeka regards the communities in which it operates as important stakeholders in this venture. This symbiotic relationship will not only boost the economy, the region, but also forester environment an sustainability. The slogan "Forestry for Life” emphasizes SiyaQhubeka's philosophy and its interdependent relationships with the natural environment, the forestry industry, life, people, growth and value. The logo embraces these elements. The thumbprint, symbolic of the uniqueness of the human spirit, represents the need of each human for harmony, energy, encouragement and wealth. The tree embodies the elements of nature - water and air, without which growth and life cannot be possible. It is also indicative of the forestry sector.